Run and explore 'what if' scenarios. View detailed theoretical profit/loss information. Detailed graphs show maximum profit/risk, break-evens, and beyond. Multiple break-even analysis at expiration and current value. Save and print created positions. Handles strategies that have up to four legs. This would include anything from single Option trades, to complex butterfly spreads..
'Position Monitor' tracks and organizes your investments. Test your trading strategies and more. 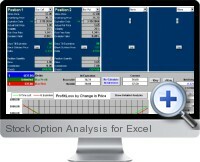 Option strategies supported by Stock Option Analysis for Excel are: Long Call/Put; Short Call/Put; Long/Short Stock; Covered Call; Bull Call/Put Spread; Bear Call/Put Spread; Long/Short Straddle; Long/Short Strangle; Ratio Call Spread; Ratio Put Spread; Call/Put Ratio Back spread; and Butterfly Spreads.